What Is PlayStation Vue, and Can It Replace Your Cable Subscription? Getting away from traditional TV service is becoming more and more popular, with streaming TV services leading the charge. 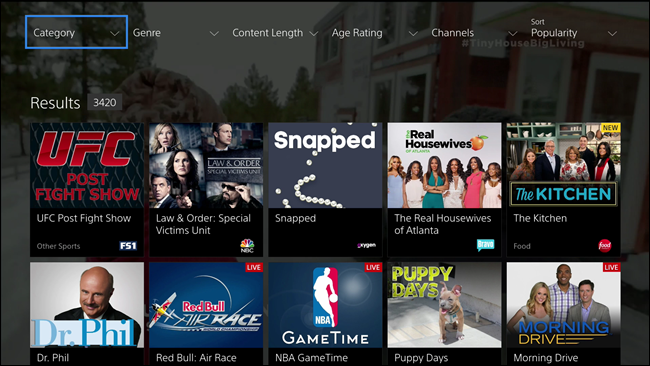 Today we’re going to take a closer look at Sony’s take on TV streaming: PlayStation Vue. 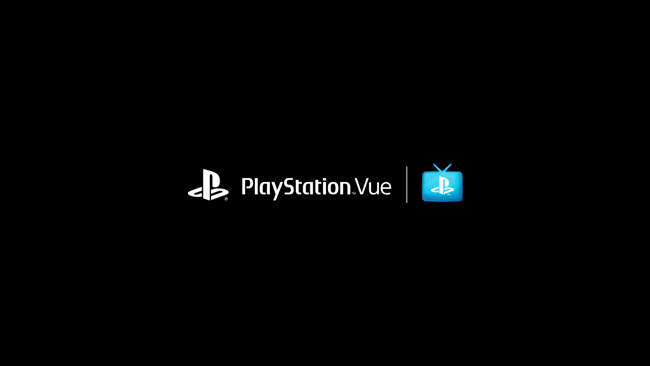 PlayStation Vue is Sony’s take on traditional TV. It streams live TV over the internet, with most of your favorite cable and network channels along for the ride. Despite its namesake, PlayStation Vue isn’t just available on PlayStation devices—there are also apps available for Android, Android TV, iOS, Apple TV, Fire TV, Roku, and Chromecast. It also works in the browser, though the experience is pretty watered down compared to the full application experience. Either way, even if you don’t have a PlayStation 3, PlayStation 4, or PlayStation 4 Pro, you can still benefit from PlayStation Vue. Good move, Sony. When you sign up for Vue, you’ll have to select your home location. 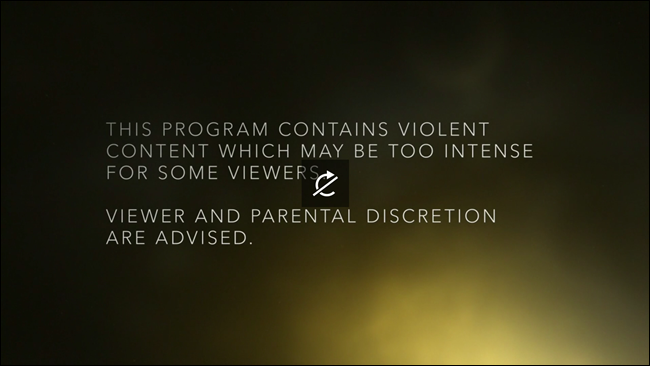 That’s probably the biggest thing worth noting about Vue: some channels are geo-restricted. I’m going to assume these are local channels, but restricted channels will only work when you’re inside of the Home Location that you set when you sign up for service. You can modify your home location if you move, but you can only do so once. Otherwise your account may be blocked from service. It’s really kind of bizarre, and something I’ve never experienced with other streaming services. That said, it does make sense—they don’t want you living in Dallas but getting access to Chicago’s local channels. Access, $39.99/Month: This is the entry-level package, which offers 45+ channels including ESPN, Fox, Disney, and more. At the time of writing, this package is on sale for $39.99 a month, with a normal price of $49.99 a month. Core, $45.99/Month: All of the channels included in Access, plus access to regional and national sports channels, for a total of 60+. At the time of writing, this package is on sale for $45.99 a month, with a normal price of $55.99 a month. 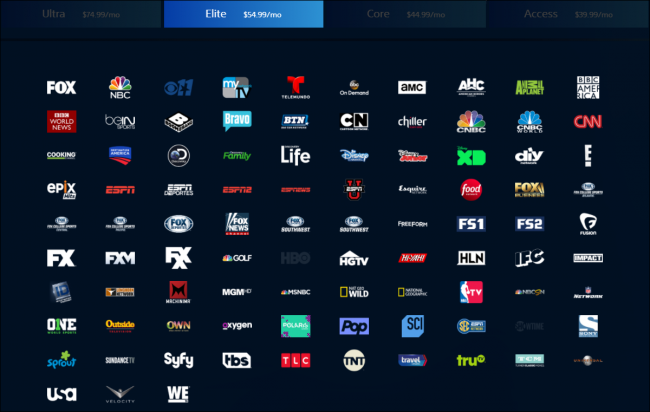 Elite, $54.99/Month: All Core and Access channels, plus more sports, movies, and entertainment channels, for a total of 90+. At the time of writing, this package is on sale for $54.99 a month, with a normal price of $64.99 a month. This is the service I used for testing. Ultra, $74.99/Month: All the channels from Elite, plus HBO and Showtime. Epix Hits: $3.99/Month. Included in Ultra. Premium Pack (Showtime + Epix): $13.99/Month. NFL Red Zone: $39.99 per season. Sony also offers one to two dollar discounts on certain channels for PlayStation Plus subscribers. Overall, the plan and pricing structure of PlayStation Vue is more traditional than some of the other services out there, but the pricing scheme itself still seems to lean more towards the affordable side in comparison. The argument can (and undoubtedly will) be made for the inclusion of internet service costs when comparing these sorts of services to their cable-specific counterparts, but most people will have internet service either way, making that an unfair adjustment. When it comes down to it, using PlayStation Vue is very comparable to that of a traditional cable setup. Navigating through the channels is a very familiar experience, as the guide has a nearly-identical layout. The primary difference here (as with all streaming solutions) is that there are no channel numbers or a dedicated remote control, so you can’t just jump straight to one specific channel by punching in a few digits. 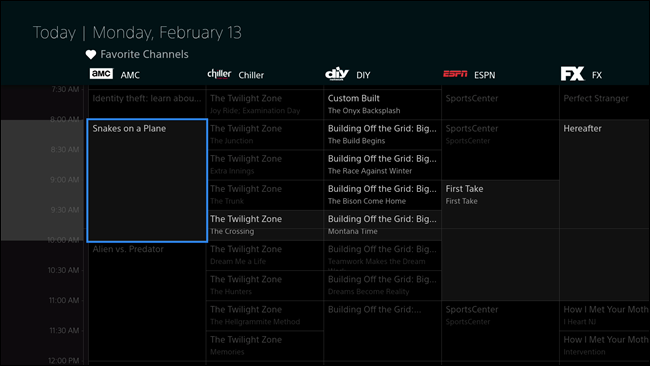 You can, however, add favorite channels, which will show up first in the guide. That’s a nice touch. The rest of the Vue interface is equally simple, too. 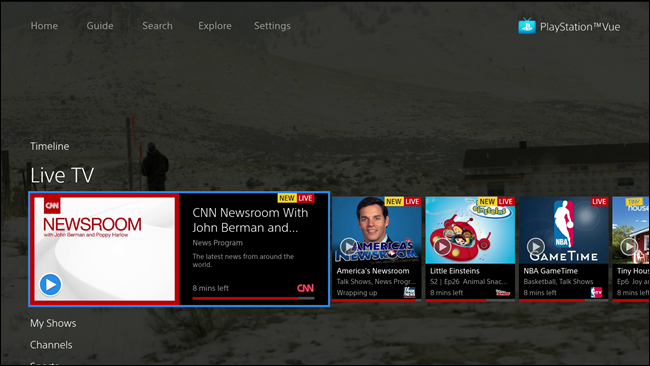 The “Home” screen, which will show on top of what you’re currently watching, offers quick access to info about what’s playing (along with what’s coming up), Live TV, your shows and favorite channels, as well as various specific categories: sports, kids, and featured content. This allows you to quickly and easily browse through what’s on without completely navigating away from what you’re currently watching. You can also search for specific content, or explore recommendations by category, genre, length, age, or popularity. This way, if you’re looking for a specific style of show to watch but aren’t sure what’s on, you can find it pretty easily. 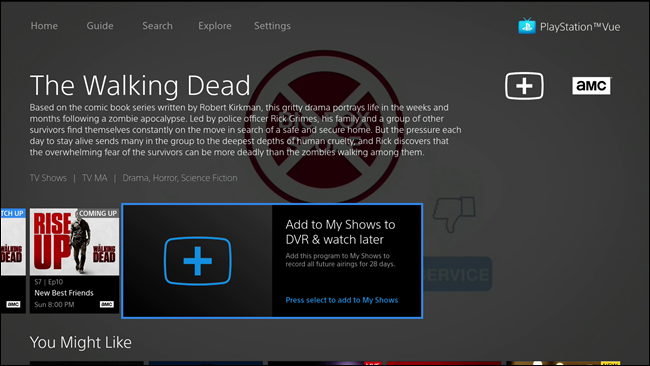 There’s also another big feature worth talking about with PlayStation Vue: DVR service. With Vue, you can add shows to the “My Shows” list and it will essentially record them into a cloud DVR for watching later. This is huge for those of us who like to watch on our own schedules. There are, however, a few downsides: some channels don’t allow “catching up” on current episodes or allow past episodes to be streamed on demand. Similarly, you can’t fast-forward on some channels, which means no skipping the commercials. Bummer. Lastly, you know how some channel apps on your phone or tablet allow you to log in with an existing cable subscription so you can watch new episodes? Well, you can also sign in with your Vue account…most of the time. 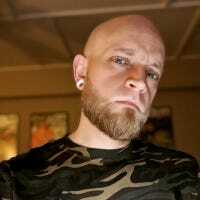 Not every channel will support Vue, but many do. There’s a full list of apps that will work with your Vue account here. Honestly, we don’t have a lot of bad things to say about PlayStation Vue. It’s not perfect—more shows could offer On Demand content, for example, or fast-forwarding could be available across the board—in other words, it could stand to be a little more like traditional cable in some respects. Otherwise, the primary downside of Vue can also be said for all streaming services: it’s a streaming service. If your internet goes down, you have no TV. Similarly, sometimes you have issues with the quality of the stream, even on super-dependable internet. These things happen, and they can be infuriating. And if you have a data cap, you’ll want to keep an eye on it. You can also use PlayStation Vue Mobile on up to 3 iOS and Android devices, as well as PlayStation Vue on Fire TV, Roku streaming devices, and Chromecast. Up to five total streams are supported at once! That’s kind of a weird set of stipulations there, but it is what it is. Something to keep in mind, especially if you have a large household where everyone wants to watch something different at the same time. Past that, I think Vue is an excellent service that definitely deserves your attention if you’re in the market to move to a streaming service. So, Can Vue Replace Your Existing TV Service? For many people, I’d say yes. Of course, the needs and requirements of each user are different, so research will undoubtedly be warranted on your part. But with local channels, DVR, and and excellent selection of channels between the various packages, I personally wouldn’t have a single issue moving from a traditional cable or satellite service to PlayStation Vue. As mentioned before, however, Vue isn’t the only streaming service out there. There’s Sling TV, DirecTV Now, and even Hulu, which will be offering its own TV-like service. We’re going to be taking a closer look at all of these in the coming weeks, with a full comparison shortly thereafter.